Like humans, horses can carry some heavy emotional and physical pain “baggage’ from their pasts. As horse handlers, we may or may not get to know about that past pain. The burden of this past-trauma (real or imagined) has a tendency to surface unexpectedly and may spiral out of control quickly. The best we can do is help the horse feel safe, try to comfort him as best we can and direct his energy in a more positive direction–in the hopes that his mind will calm and he’ll be able to think his way back to some sense of normalcy. At a recent clinic, I met a horse who reminded me what it’s like to feel out of control—and he taught me what can be done to create a place of calmness where learning can occur. Other horses were too busy looking at all the unknown horses and cycling through a range of emotions from excitement, to flirtatious, to intimidating, to cocky and strutting like a peacock. Some horses had the appearance of a well-heeled dog–keeping one keen eye on their handler so as not to miss any cues or expectations. At the same time, these horses took in as much information as possible from the other horses and the unfamiliar environment. A few of the older, seasoned horses stood quietly, half asleep and giving the occasional stink eye to the ‘uncivilized’ horses. As I got the rest of the horses and handlers moving about the arena in an orderly fashion, I asked the woman with the troubled horse to tell me about him. “I have no idea what’s wrong with him! He’s not normally like this at home,” she cringed in embarrassment, like a mother whose kid just threw a wall-eyed fit in a restaurant. “Well never, really,” she started. “You see, I’ve only had him for a few months and this is our first attempt at a road trip. He came from a rescue, so I don’t really know much about his history, but I think he was abused. One thing was very clear to me, this horse was stressed out way beyond the point of thinking and his owner was certainly not getting any more confident. She looked like she’d be happy to tuck her tail and run out the arena gate–gladly forfeiting the tuition and chalking the whole thing up to lessons-learned if I gave her even the slightest opening. Meanwhile, the horse was reaching back into his most basic survival instincts. He forgot everything he knew about his training and was getting more angry and frustrated by the minute. He cried out for help in every way he knew how. No horse is happy in this state and no horse wants to feel this way—it’s just the only way they know how to feel. They don’t know how to get rid of that bad feeling except to fight or flee. I feel like it’s my job as a horsemanship clinician, to give the horse (and human) what he needs in the moment to feel safe and comfortable. Because only when his mind is calm and relaxed, is he capable of learning and growing. Without question, the same can be said of humans too—when the mind is in a state of stress and turmoil, it’s hard to get much clear thinking done. Before the horse owner could get any closer to the exit gate, I asked her if I could take her horse for a few minutes to see if I could help him. It only took 10-15 minutes of guiding his energy, telling him where to go, how fast to get there and how to act in the process. I provided him with structure, guidance and praise–making all the decisions for him so he didn’t have to think, until he began to soften. As the horse began to understand the very simple things I was asking and the clear and quiet directives I was giving, things made sense to him again. He could trust me and realized that it might benefit him to listen to what I had to say—especially since leaving was not an offered option. Once his focus came onto me, I stopped him to let him rest and turned my back to take away all the pressure. It wasn’t long before he exhaled deeply, lowered his head and rested his very busy mind and body. Soon he was licking his lips and dropping his head as his eyelids went to half-mast. Horses are emotional animals, perhaps more emotional than even humans. Maybe it’s because of their sheer size or because of their exceptional capabilities when it comes to fight or flight. But when a horse has reached his limit and his emotions boil over, it can be a scary and daunting challenge for us humans. In fact, most of us would be so uncomfortable around a horse like that, we would want to look the other way or shun the horse as bad. It’s far easier, and sometimes safer to get rid of the emotionally troubled horse than it is to be empathetic and to work through the problem to help him feel safe and find some peace. But there was good in this horse, he didn’t need to be ignored or shunned. This horse needed to be understood. He needed kindness, patience and a release of pressure. Horses and humans can both feel this sense of “out of control.” I’ve learned from personal experience that when people are in turmoil–mentally or emotionally–they are in a very lonely and desperate place and what they need most in that moment is kindness, patience and a release of pressure. I understood this next concept with horses long before I came to understand people are the same way—when they are struggling with depression, anxiety, post-traumatic stress or any number of mental health issues. It’s far easier to cross the street to get away from that angry/frustrated/volatile being than it is to look him in the eye and ask sincerely how you can help. Because horses and humans share this common emotional connection, it comes as no surprise that horses can help humans who are struggling with mental health issues of any kind. Horses are especially good at helping those who feel stress and fear. 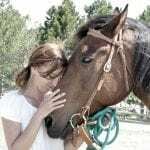 No human is more empathic than a horse when it comes to understanding your fears and no human is more honest in reacting to your own emotions than a horse. That’s why the therapeutic value of horses is so high. Horses have survived in our society for thousands of years—long after their usefulness in “paving civilization,” they have adapted and survived and made themselves valuable to us in so many different ways–from sport to entertainment to therapy. Today, perhaps one of the greatest gifts we get from horses is the mental health benefit that we –all riders and handlers get. Whether an autistic child, a wounded warrior, an abused spouse, a person with a physical handicap, or a person struggling to control their emotions, there is help with horses. They understand. Horses make me a better person—they teach me patience, emotional control, clear communication skills. And they make me look within myself a lot—even when it is not comfortable to do so. Horses have a unique way of giving us exactly what we need in the moment to find our place, to quiet our minds, to rise to a challenge and to be a better person. Just like the horse in my clinic, horses are beautiful teachers. They are survivors; and if we pay close attention and understand what they need, they can help us all to survive in this often-crazy world. I have just signed up for free access to Julie’s website. I watched the home page video, signed up and this is the first article I opened as it was exactly what I was looking for to share with two granddaughters. Thank you Julie for this website and your generosity in providing free access. Thank you for putting all of this in perspective. I have a mare that is a rescue. Even 8 years later she will revert to a behavior out of the blue. I know that emotional baggage can stick with them forever. I am wondering if I am being to easy on my spooky gelding. Whenever he pulls at the rail or panics I run him for not running away. I rub him and remain calm. A trainer told me I was teaching him that it’s ok to panic. Should I do a quick head jerk to let him know it’s not ok ? I guess I am a library member today. Will you still help me ? This article was very timely as we many times watch the show or a video of yours and you seem to have answers to a situation we are maybe struggling with or just questions on a simple thing that makes all the difference. Yes, it has been a revelation to us just how emotional horses can be. Also how quick they pick up on our emotions too and react accordingly. Seeing horses just going around in circles and upset in their stalls because the weather outside was not fit for them to be in their turnouts today, was so revealing. Talking calmly and trying to sooth their frustration helped and it is such a beautiful thing to experience. They really do connect to us on so many levels. My own horse is a calm and steady fellow but at times will have a fit about something. It doesn’t take much to realize that it may even be us around him that may be causing it. As soon as we change our approach to whatever it is, he once again becomes soft in the eye and back to his normal quiet and sweet guy. Thank you for this article which also emphasizes how important mental health as well as physical drawbacks are so improved in connecting with horses. I’m riding just because of injuries and of course, loving horses too. It all came about when a cousin actually got out of a wheelchair he had been in for 15 years and never has gone back due to riding again. We never can thank there marvelous animals enough for their special connections to us. Once you let them into your soul, they will never leave you!! Well said, You are good at what you do..
One of the things I like so much about Julie is her ability to calm and to build confidence in both the horse and the human. This is a great article! Thank you. I am only a free access member at this time, but I am contemplating an upgrade. I meant free access member, not library member yet. Thank you for writing this very honest and beautiful article about the horse rescues. Yes, I currently have 4 rescues in my barn that I am working with and they are always a challenge. I competed in the Extreme Mustang Makeover this year and have trained a lot of mustangs and domesticated horses through the years, but I have always found that it takes so much more time, love and concentrated training to help the rescues work through the emotional baggage of abuse or neglect than any of the other horses I’ve had the privilege to work with. There is no such thing as a 90 day program for these horses. Some of them take years to work it out. I have a Palomino mare that took 3 years to work out her fear issues and 2 Appaloosa geldings that were neglected to the point of being a body score of 2 when I got them. So improving their self-worth has been a 2 year process. Thank you again for the great article and bless all those people out there that have the heart to rescue beautiful horses for beautiful homes!! !